Scheduled annually on the second Friday of March, Latina History Day is the only conference in Los Angeles that is designed specifically to meet the needs of Latina professionals; offering resources, skill development, and networking opportunities to advance their careers. 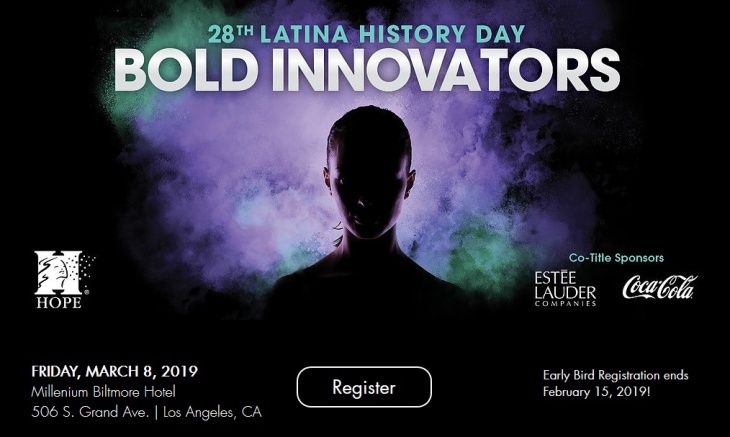 This year's theme recognizes Latinas as the bold innovators they have been historically and the innovative contributions they continue to make today. Join HOPE and be inspired by fellow Latina speakers and professionals who are leading the charge in their fields and creating bold innovations every day. The conference is sponsored by The Estée Lauder Companies and Coca-Cola. HOPE® - Hispanas Organized for Political Equality - is a nonprofit, nonpartisan organization that has focused on empowering our communities through advocacy, Latina leadership training, and increasing knowledge on the contributions Latinas have made to advance the status of women for the past 30 years. To date, HOPE’s innovative programming has served 56,000 Latinas statewide and touched the lives of several thousand more.